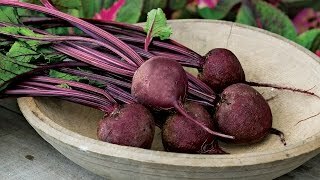 With earthy sweetness and rich colors, beets are a delicious addition to your garden. We show you how easy it is to grow your own. Mixed stir-fry feeds a family of four. Beets are a cool season favorite grown for their fleshy, round to oblong roots. Beets can also tolerate hot temperatures too. Sweet beets and tart apples make this a colorful, zesty salad.